RAJMAHAL HOTEL, AGRA invites you to bask in an atmosphere which is a blend of contemporary ambience and hospitality at its warmest. It is nestled at stone’s throw distance from the world’s awesome wonder – The Taj Mahal. You just have to draw the curtain of your window and there it is looming large on the horizon. Starlit sparkling lobby and smiling team of the Hotel extends the traditional Indian welcome to your most solicited presence with its open arms, marigold and rose garlands and an auspicious red “tilak” on your forehead. Soothing aesthetics at the forefront, cozy rooms with modern furnishings, instantly embraces your thought - “home away from home”, an honest effort to ensure every comfort while you are with us. 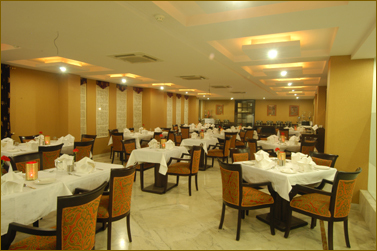 Zaika - our world dining restaurant caters to one and all taste buds. The sumptuous variety of culinary is served on your plate from our hygienic and modern kitchen prepared by seasoned commissars. Swastha Spa is there to rejuvenate your body and soul. Having achieved the height of Ayurvedic art of massage, the masseurs are always at your beck and call equipped with best of herbal oils and creams from the land of Ayurveda. Machaan – the roof top lounge provides you with a rare opportunity of Taj Mahal view while you nurse your drink with delicious delicacies. Banquet Hall can cater to a 125 pax luncheon/dinner meetings convened in our well equipped conference hall. Currency Exchange, Backup Generator, Doctor on Call, Room Service, Airport Transportation, Security Guard, Parking, Breakfast Services, Laundry Facilities, Travel Counter. Cable/Satellite TV, Toothbrush/Razor on Request, Wakeup Calls, Attached Bathroom, DVD Player, House Keeping, Air Conditioning Room, Iron/Ironing Board, H/C Water. User reviews for "Rajmahal Hotel Agra"